Threshold Cards came about because I was not happy with the Threshold Point rules when running the original SFSFW participation game of Full Thrust. When running that game, I did think about sorting something out, along the lines of Threshold Cards, for the game However, we didn't have the time and we only had one more show to go, so didn't seem worth doing. With Godzilla, Destroy All Monsters!!! not ready? Well sadly the scenery for the Five Armies was on the verge of falling apart and could not be used. Lets do Full Thrust again said the committee, and there you have it. With time to spare, and that we were going to do Star Trek, I decided lets try out the Threshold Cards. Most people will immediately recognise some of the system from West End Games' Star Wars game, Assault on Hoth, which was one of the main influences. Whereas before when you had crossed out the damage boxes and reached the end of one line, then you had reached a Threshold Point. Then you had to roll for each of your systems to see if it was still working. Threshold Cards are used to replace these dice rolls. When you consider that you are only drawing cards instead of rolling dice, it certainly saves time. On the first line of damage boxes, before the player needed a six for the system to be knocked out, now the player draws one Threshold Card. On the second line, a 5,6 was needed, the player draws two Threshold Cards. On the third line, a 4,5,6, now the player draws three Threshold Cards. The cards are drawn one at a time, one for dramatic effect, it certainly adds atmosphere to the game, as the firing ship awaits to see what damage that last salvo of photon torpedoes did. Two, some cards require further action, drawing more Threshold Cards for example, before the second (or third) card is drawn. These cards can cause the same effects as the original Thresholds Points rules, sometimes minimal damage, othertimes major losses to all systems. However, this was Star Trek - Full Thrust, therefore, I wanted to add a flavour of the films and TV shows. It is possible after reaching the first Threshold Point, for there to be a warp core breach... The ship will explode in an incandescent light. Nasty! Also in the pack are Final Frontier Cards which means the player has to pick a card from a different deck. This is almost straight from Assault on Hoth. I wanted cards that could help or hinder a player's ship. These cards describe various events that can affect the game. Some have to be played immediately; a dimensional rift causes another ship to appear and join the battle; or intervention by the Organians which means the game is over. Others can be held onto and played in a later turn; repair teams fix or jury-rig two of your systems; or lucky shot enabling your tactical officer to bypass an enemy ship's shields. There are a few personality cards, whereupon you find a character from the TV on your ship. These characters will help or hinder your ship. For example, we know how wonderful Tasha Yar is, so she will add two dice each time you fire weapons upon a ship. 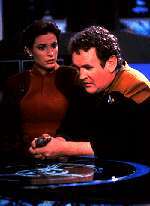 We also know what a terrible pain in the neck, Deanna Troi can be, so she loses you two dice. Care is needed with Final Frontier cards, and it would be useful to have an impartial referee around. For instance with Tasha Yar aboard the Enterprise D, with four A class phasers (beams) it is not possible when firing at a Romulan Warbird (under 12" away), to fire each phaser in turn, adding two dice to each phaser. In this situation, the Enterprise D player should throw fourteen dice and not four throws of five dice (twenty dice in total). You may want to amend this card, so that the dice Tasha adds are per turn and not per attack. So what of the cards themselves, hmm, when I originally did them, I did not consider how popular they would be and how many people would ask for them to be published in ENTERPRISE (which didn't even exist then). I printed off pages and pages of cards, shoved them through the photocopier onto card, cut them out and covered them in clear sticky-back plastic. My photocopier was slightly off, and the backs did not line up with the fronts, causing them to look off centre, but no one seems to have minded. Now why did I choose these cards and the number of each, well, it wasn't really choice, more "well that's how it happened". I did a page of phasers, a page of disrupters, a page of shields, a page of minimal damage and so on. In order to finish the wodge of card I had, I copied a few more of some of the sheets. Look that there are fourteen on one type minimal damage card, and eighteen of another... Having now counted them, I think they may be just a few too many shields down card, maybe not as this does reflect what happens in Star Trek. In the end I think the mix is about right. In most games, you may get a FINAL FRONTIER card, but not every game, nor will every ship immediately explode because of a warp core breach. I also don't think you need as many cards as this, but for a participation game it looks good. Something else to consider, these cards were written for Star Trek - Full Thrust and are therefore not suitable for "normal" games of Full Thrust using NAC and ESU ships. Why, well, statistically, when a large ship gets hit in "normal" Full Thrust, there is more than a probability that a system will be destroyed, maybe more than one. With the cards as they are, it more likely that only one system will go down, but there is now a chance that your ship will explode, which cannot happen in "normal" Full Thrust. The cards however do reflect what you see in the Films and on the TV shows. Change what cards you like, add more of a certain type, restrict more of another - you may wish to halve the number of minimal damage cards for example. You have been hit in Engineering. There is a Warp Core Breach in progress. Roll 5,6 on a D6 to successfully eject the warp core and lose Warp Drive. Otherwise the ship explodes violently. You have been hit in Engineering. There is a Warp Core Breach. The ship explodes violently in a bright flash of light. You have been hit in Engineering. There is damage to the Warp Core. Your Chief Engineer successfully ejects the warp core and you are safe, though you lose all Warp Drive. You have taken damage to the engines and lost impulse power. You have lost your Impulse Drive. You may not change velocity/speed, nor can you turn. Warp engines are still on line. You have taken damage to the engines and are down to half impulse power. Your Impulse Drive value is halved. If it was already half, it is now off line and you may not change velocity/speed, nor can you turn. The warp core was about to breach when Wesley Crusher (or equivalent) managed to fix everything, just in time for the commercial break. Nothing vital is damaged. You have been very lucky. Apart from some large violent sparks coming from the Science Station and the holodecks not functioning, nothing vital is damaged. You have been very lucky. Apart from a few scratches on the paintwork and a few spilt drinks in ten forward, nothing vital is damaged. One Disrupter is destroyed. The firing ship may choose which Disrupter is damaged. Ignore this card if your ship is not armed with Disrupters. Two Disrupters are destroyed. The firing ship may choose which Disrupters are damaged. Ignore this card if your ship is not armed with Disrupters. The Disrupters are offline. From the next turn, roll 5,6 on a D6 each turn to see if they come online, otherwise all Disrupters are unoperative. Ignore this card if your ship is not armed with Disrupters. One Phaser bank is destroyed. 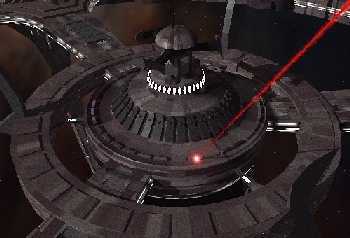 The firing ship may choose which Phaser is damaged. Ignore this card if your ship is not armed with Phasers. Two Phaser banks are destroyed. The firing ship may choose which Phasers are damaged. Ignore this card if your ship is not armed with Phasers. The Phaser banks are offline. From the next turn, roll 5,6 on a D6 each turn to see if they come online, otherwise all Phasers are unoperative. Ignore this card if your ship is not armed with Phasers. Large sparks and a loud explosion on the bridge indicates that a Tactical Station is now destroyed. Once all Tactical Stations are gone, your ship may not fire any weapons. Large sparks and a loud explosion on the bridge indicates that ALL Tactical Stations are destroyed. Your ship may not fire any weapons. There is a massive reaction to the explosions aboard your ship, which results in a feedback of a violent energy pulse back to the firing ship. It explodes in an incandescent light. Take one card from the FINAL FRONTIER card deck. Your shields finally give way. One of your shields is destroyed. You must take account of this in future, when opposing ships fire at you. Your shields finally give way. ALL of your shields are destroyed. You must take account of this in future, when opposing ships fire at you. Your Photon Torpedoes are offline. From the next turn, roll 5,6 on a D6 each turn to see if they come online, otherwise you may not fire any Photon Torpedoes. Ignore this card if your ship is not carrying Photon Torpedoes. A lucky shot destroys one salvo of your Photon Torpedoes. Cross one of the salvos off your sheet. Ignore this card if your ship is not carrying Photon Torpedoes. A lucky shot destroys ALL of your Photon Torpedoes. Cross all of the salvos off your sheet. Ignore this card if your ship is not carrying Photon Torpedoes. That last shot played havoc with the structural integrity of the ship. Take another D6 points of damage - and any extra Threshold Cards if you go over another threshold point. Your inertial damping field is offline. You may not turn by more than one point (arc). On subsequent turns, a roll of 6 on a D6 means that your repair crews have managed to fix it. Complete failure of all systems. Your ship comes to an immediate halt, all weapons, shields and everything else is offline for D6 turns. Complete failure of certain systems on your ship, the damage is worse than you first thought. Immediately take TWO additional Threshold Cards. Complete failure of certain systems on your ship, the damage is worse than you first thought. Immediately take THREE additional Threshold Cards. Complete failure of certain systems on your ship, the damage is worse than you first thought. Immediately take FOUR additional Threshold Cards. The damage is terrible, you have lost one of your shields, your warp drive is offline and impulse power is down to half. Not only that, Tactical reports that two Phaser banks (or Disrupters) are burnt out and unoperative. Where no quantity is stated, this means there is only one of these cards. Due to the nearby explosions, a dimensional rift has been torn in the fabric of space and time. Out of nowhere, comes the USS Enterprise NCC 1701-D under the command of Captain Jean Luc Picard. He will fight for the Federation and Next Generation era Klingons. He will fight against all Romulans and early Klingons. Due to the nearby explosions, a dimensional rift has been torn in the fabric of space and time. Out of nowhere, comes the Romulan Warbird, Dark Wing, under the command of Commander Sela. She will fight for the Romulans and Klingons. She will fight against all The Federation and Klingons fighting Romulans. Due to the nearby explosions, a dimensional rift has been torn in the fabric of space and time. Out of nowhere, comes the USS Enterprise NCC 1701-B. The captain will fight for the Federation. The captain will fight against all Romulans and Klingons. Due to the nearby explosions, a dimensional rift has been torn in the fabric of space and time. Out of nowhere, comes the USS Enterprise NCC 1701 under the command of Captain James T Kirk. He will fight for the Federation. 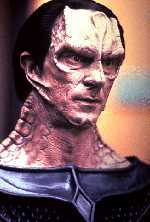 He will fight against all Romulans and Klingons. Due to the nearby explosions, a dimensional rift has been torn in the fabric of space and time. Out of nowhere, comes two Vor'Cha Klingon Attack Cruisers. They will fight against everyone. Due to the nearby explosions, a dimensional rift has been torn in the fabric of space and time. Out of nowhere, comes a Klingon Vor'Cha Attack Cruiser under the command of Captain Kurn (with Worf). They will fight for the Federation and all Klingons. They will fight against all Romulans. As that final shot hit home, it struck one of the warp nacelles. This was followed by a catastrophic warp core breach. Your ship immediately explodes in a stunning display of incandescent light. As that final shot hit home, it struck one of the warp nacelles. This was followed by a catastrophic warp core breach. Your ship immediately explodes in a stunning display of incandescent light. However, there is a massive reaction results in a feedback of a violent energy pulse back to the firing ship. It explodes in a similar light. Entering from nearby space comes a BORG scoutship. It immediately drops out of warp and takes station in the centre of the table. It will only start attacking, if it is itself attacked. The opposing sides may continue fighting, but may decide to join in a truce (short term only mind you) to attack and destroy the BORG ship. As that final shot hit home, it struck one of the warp nacelles. This was followed by a catastrophic warp core breach. Your ship immediately explodes in a stunning display of incandescent light. However, this has a strange effect on the fabric of space and time. Suddenly each ship finds itself back where it was when the game started. Re-shuffle this card back into the deck. A repair team has managed to fix and jury-rig ONE of your systems (your choice). It is now back online and fully operational. Photon Torpedoes may not be repaired. A repair team has managed to fix and jury-rig TWO of your systems (your choice). It is now back online and fully operational. Photon Torpedoes may not be repaired. A repair team has managed to fix and jury-rig THREE of your systems (your choice). It is now back online and fully operational. Photon Torpedoes may not be repaired. One of your people on Tactical has managed to penetrate the enemy ship's shields. For this turn, your attack is as though the enemy ship's shields are down. All attacks by other ships still have to contend with the shields. Next turn, the enemy ship plugs the gap and its shields are back to normal. This card has no effect on a ship with its shields down already. One of your people on Tactical has managed to penetrate the enemy ship's shields. Not only that but he hit one of the warp nacelles. This caused a warp core breach, and the enemy ship explodes into an incandescent light. All this and you didn't need to throw a single die. One of your people on Tactical has managed to increase power to the ship's shields just as an enemy ship launched an attack. Regardless of what it gets on the dice, it causes no damage. You may wait until your opponent has thrown their dice before playing this card (for maximum effect). For some reason, Deanna Troi is aboard your ship. Due to her, everytime you throw dice when firing phasers, disrupters or torpedoes, you must take TWO DICE away. This card only affects Federation and Romulan ships. She would not be seen dead on a Klingon ship. You may play this card against an opponent or a friend. For some reason, Worf is aboard your ship. Due to him, everytime you throw dice when firing phasers, disrupters or torpedoes, you must take ONE DICE away. This card only affects Next Generation Federation and Klingon ships. He would not be seen dead on a Romulan ship. You may play this card against an opponent or a friend. For some reason, Spock is aboard your ship. Due to him, everytime you throw dice when firing phasers, disrupters or torpedoes, you must add ONE DICE. This card affects all ships. You may play this card against an opponent or a friend. For some reason, Data is aboard your ship. Due to him, everytime you throw dice when firing phasers, disrupters or torpedoes, you must add ONE DICE. This card affects only Federation ships. You may play this card against an opponent or a friend. For some reason, Tasha Yar is aboard your ship. Due to her, everytime you throw dice when firing phasers, disrupters or torpedoes, you must add TWO DICE. This card affects only Federation ships. You may play this card against an opponent or a friend. 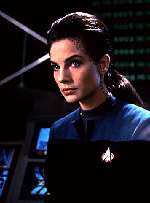 For some reason, Commander Sela is aboard your ship. Due to her, everytime you throw dice when firing phasers, disrupters or torpedoes, you must add ONE DICE. This card affects only Romulan and Next Generation Klingon ships. She would not be seen on a Federation or early Klingon ship. You may play this card against an opponent or a friend. For some reason, Captain Kang is aboard your ship. Due to him, everytime you throw dice when firing phasers, disrupters or torpedoes, you must add ONE DICE. This card affects only Klingon ships. He would not be seen dead on a Romulan or Federation ship. You may play this card against an opponent or a friend. For some reason, Barclay is aboard your ship. Due to him, everytime you throw dice when firing phasers, disrupters or torpedoes, you must take ONE DICE away. This card only affects Federation ships. You may play this card against an opponent or a friend. Something finally gives in the heat of battle, the ships shields fail completely. You may hand this card to an enemy (or a friend) anytime you like. You can wait until the dice have been rolled and then play the card. Something finally gives in the heat of battle, the ships warp core is breached and the ship explodes. You may hand this card to an enemy (or a friend) anytime you like. You can wait until the dice have been rolled and then play the card. Something finally gives in the heat of battle, take two Threshold Cards. You may hand this card to an enemy (or a friend) anytime you like. You can wait until the dice have been rolled and then play the card. 2. One ship takes a Threshold Card. 3. Sends one ship off the table. 4. Sends D6 ships off the table. 5. A random ship is fully repaired. Trouble at the High Council on the Klingon homeworld. All Klingons must now decide if they are going to fight for the Duras family or Gowron. Each Klingon ship must roll a D6: 1,2,3 fight for the Duras, 4,5,6 fight for Gowron. One ship (your choice) has got a problem. One of the crew has bought a tribble aboard. They have got into the food storage area and eaten the lot, now they have multiplied and got into all the systems. It will take D6 turns to rid the ship (2D6 if a Klingon ship) of the tribbles. Until then the ship may not fire or turn and must decelerate each turn by its full impulse rating. Play when needed. For some reason Chief Engineer Montgomery Scott ,or Scotty, is aboard your ship. Due to his fine engineering abilities, you may increase your Impulse Drive rating by TWO. This card only affects Federation ships (and the Klingon Bird of Prey). You may play this card against an opponent or a friend. Khan arrives on the scene on the USS Reliant, a Federation Frigate captured from Captain Terrell. He will immediately attack the Enterprise, otherwise each ship rolls a D6. The ship with the highest score will be the target for Khan's anger and frustration. All ships roll again, if Khan successfully destroys his first target. He will continue fighting until destroyed. Captain Kruge arrives on the scene on a Klingon Bird of Prey. He will immediately attack the Enterprise, otherwise each ship rolls a D6. The ship with the highest score will be the target for Kruge's anger and frustration. All ships roll again, if Kruge successfully destroys his first target. He will continue fighting until destroyed. He will attack other Klingons. A Threshold Cards system does make an interesting alternative to the original Threshold Point rule, but as with all optional rules, agree with your opponent before using them. Though printing them out on computer certainly does make them look nice (and professional if I say so myself), but an alternative would be to use playing cards - Ace of Spades is a warp core breach, Two of Hearts is lucky escape. You get the picture.